A perennial with dark green leaves and bright, bold flowers, that tends to be deer resistant in the home garden. This is a guide about growing primrose. Growing Hints: Purchase plants in spring or grow from seeds sown in pots in early spring or fall. If plants start to lose vigor they probably need to be divided. Once their flowering period starts to end, dig up and divide crowded plants. 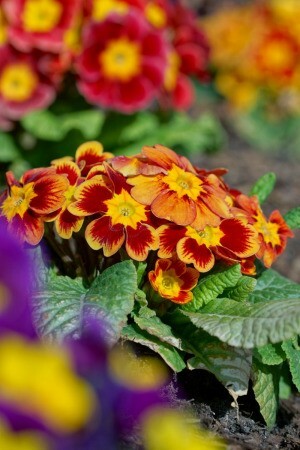 Primrose can also be propagated by rooting side rosettes that appear after flowering. Self-sown seedlings of hybrids are unlikely to produce desired offspring. 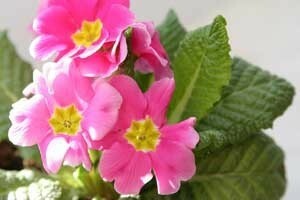 Interesting Facts: Primrose tends to be deer resistant. As a whole, many in the Primula genus, including cowslip, are known for their medicinal properties. I live in Pakistan and am a great fan of flower gardening. This year I imported plug plants of primula, begonia, and calibrachoa from UK and tried my level best to protect them from the extreme heat of Pakistan; unfortunately none survived although I provided them with ideal controlled temperature in a glassed refrigerator and under grow lights. Could you suggest some measures to protect them? My local primula are thriving in the refrigerator and have come to flowering, therefore it is strange for me as to why imported ones have not survived. Then I have planted geraniums in Jiffy's; they are growing very fast, but I suspect that they might wilt; the only cause that seems to me is excessive heat around 90 F. Kindly give me some advice. I would suggest trying to grow them underground in a basement or other area because I do not know how else to protect them from the awful heat. As well, they might need specific nutrients that your soil is just not providing. Certain plants are suited for certain areas. Never buy or try to grow anything that is not for your area. In my area, I can't grow any fruits that need 90 days of very hot weather. After a long day of "spring cleaning" in my flower beds and replanting, it was very rewarding to sit down on the porch and smell the lovely fragrance of my freshly planted yellow Evening Primrose. Note: This actually appears to be a Primula vulgaris rather than an evening primrose. Still beautiful. Here is a closeup of primrose blooming in December.